Dancing in the grove. All photos by Pavia Rosati. 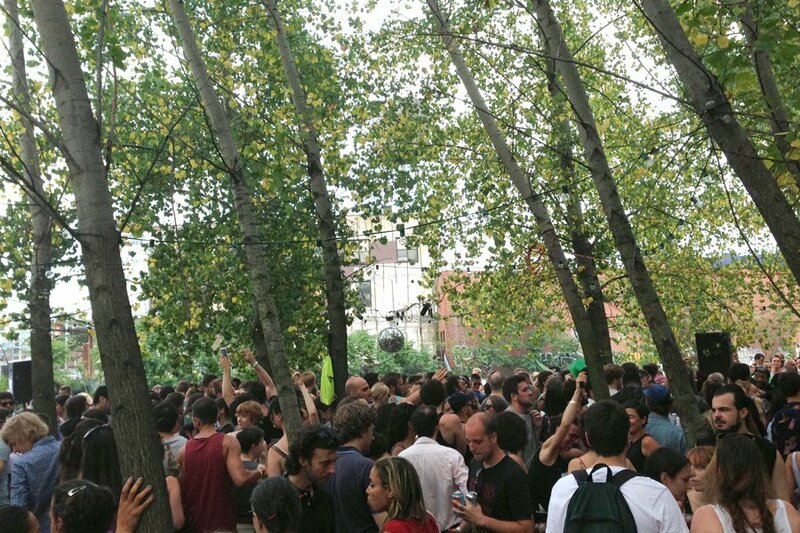 In an abandoned lot wedged between the almost comically toxic Gowanus Canal and a quiet residential street in Brooklyn, something magical happens every weekend: Mister Sunday, an all-day summer dance party. It may be one of the happiest places on earth. The music kicks off around 3 p.m., and in no time the small dance floor is packed with a multi-racial, multi-class, multi-generational crowd. That may sound like a dreamy urban cliché, but take a look at who's around you. The hipsters and the toddlers. The lawyers and the sculptors. The gays and the straights and the ones who don't want to be labeled. The locals who were born in Brooklyn and the newbies who moved from Kansas last May. 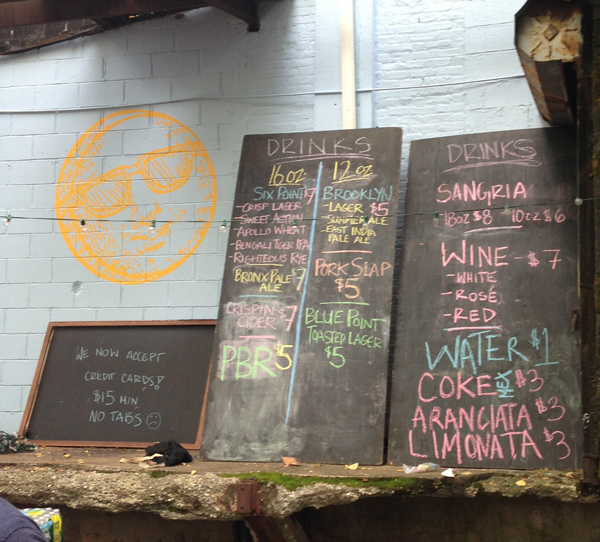 The bar serves local Brooklyn brews, sangria, and real Mexican coke. The food is farm-fresh and authentic ( does all-American fare; serves tacos and huraches). Picnic tables and the dance floor are arranged under the trees; vintage strings of lights and a disco ball hang amid the branches. It's as close to living in A Midsummer Night's Dream as you can get in New York City. In full disclosure, one of the DJs who created the party is Justin Carter, the husband of Popupla co-founder Jeralyn Gerba. But not to write about it for personal reasons would just be a disservice to Brooklyn. He answered some questions for Pavia Rosati, Jeralyn's partner. How did Mister Sunday get started? My partner Eamon Harkin and I have been involved in parties at this space, the Gowanus Grove, for six years. It began in 2008 as Sunday Best. In 2009, we started , our Saturday night dance parties. We named it Mister Sunday three years ago. More people know about it. And when more people know, we need to step up the game. This year, for example, we added a second food vendor. 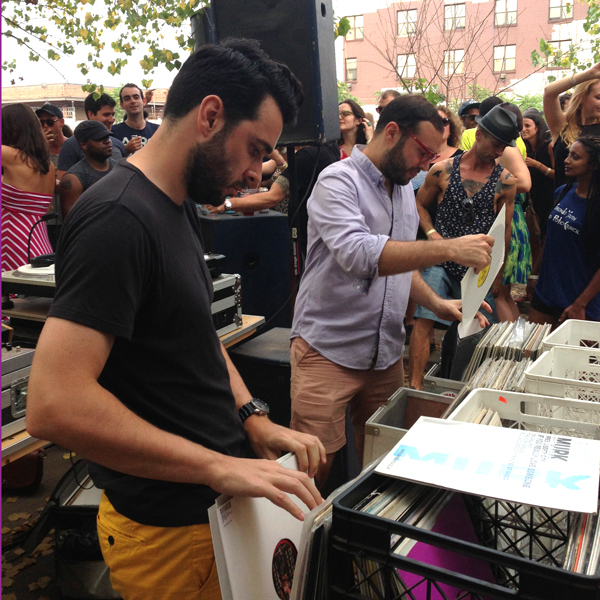 In terms of the music, the first summer we had more guest DJs. Last year we had a few, and this summer we only had one. But it's the same party it's always been — a party that focuses on the music but has a food element and good Brooklyn beer in a nice space. When we find something good, we don't mess with it too much. Can you describe the musical identity of Mister Sunday? It's always hard to talk about this. We want to be able to play anything and not have anyone be surprised what they're hearing. We're rooted in disco and house, but it's not rare for us to play hip-hop or jazz or African music. The DJs I like most are the ones who can do what they want to do for an audience that will love the fact that they won't know what's going to happen. Eamon Harkin and Justin Carter in action. The crowd is very diverse in age — because it starts at 3 p.m., parents bring their kids, which is such a great feeling. The first people on the dance floor are the three- to six-year-olds who like to do cartwheels and roll around on the ground. And we have people into their 60s and 70s. As far as the racial, ethnic, sexual orientation makeup, you do see representatives of the many communities that call Brooklyn home. I'm very pleasantly surprised that as the party has gotten bigger, the quality of the crowd has stayed strong. Parties that get big can tip over the edge, when suddenly people are there because they want to be seen at a cool place. It becomes more of a meta thing than a "I love this and want to be here." But this has been our challenge: We've always tried to make Mister Saturday and Mister Sunday open to everyone. We set an expectation before people show up. From the way security guards greet people, from the way bartenders talk, people get that this is a place where you're supposed to smile at each other and be nice. This is not a place to come and be showy. Also, when more people come, you need more food vendors and more bathrooms. We made the bar longer because we didn't want people to spend a long time waiting in line for drinks. If people don't feel like they're being respected, they in turn won't be respectful. Even if you didn't know what this party was about, you get it when you walk through the door. That's one reason why even though we've grown, we have grown in a good way. It's all good under the trees. I know you're going to love this one. Do you take requests? NO! We have a specific musical vision and we want to do our thing. Even if you request something on our label. That is our creative outlet. We have . It used to be that because the party was only listed in a few places and rarely written about in mainstream press, there was a very self-selecting crowd. That meant we didn't have to define the rules of the house as much. As we've grown, and more people who aren't necessarily from our little world have started to come to the party, we've needed to define what we are and aren't okay with. All of our rules could really be summed up as, "Have a good time. Just make sure your good time doesn't infringe on someone else's." One of the rules that many newcomers find the most surprising is our no photo and no cell phone policy on our dance floor. It's a bummer when you're dancing and someone next to you is motionlessly staring into their phone or obliviously backing into you to take a photo. One of the great things about being on a dance floor is the awareness you get from moving in time with other people. The cell phone and camera rule is to make sure that doesn't get lost. You can take pictures of the dance floor, but not on the dance floor. We want people to be in the moment. How do you and Eamon split your DJ duties? It's pretty loose. We both prepare at home and bring the records we're going to play. We don't talk much about it, but we know each others' styles. And we have so much music in our bags that we can respond to each other's stuff. We tend to play longer sets early in the day, but starting at 7, we play two records back and forth until the end of the party. l 9 p.m. on the dot. The party gets pretty magical at the end of the night. The sun goes down, and we turn the lights on in the trees. It's really special. There's something so nice about a party that has an end. With most parties, even at a friend's house, there's a trickling out. At our Saturday parties, which go until 6 a.m., the crowd is an arc through the night that gets mellow at the end. But the nice thing about this party that ends at 9 p.m. is that we get to build it up and play those end-of-night songs to a full-on dance floor. It's really, really fun. This isn't something we planned, by the way. Out of respect for our neighbors, we decided to end at 9. It's a happy accident. The Mister Sunday logo and the bar menu. You guys often get booked to play gigs around the world. We have the luxury, which is rare among DJs, of having a great thing going at home with Mister Saturday Night, so we don't HAVE to tour. When we tour it's because they're gigs we want to do in places we want to go. We tour three times per year, and for the most part in Europe, especially the UK and Germany. Do you have any favorites spots in Europe? On of the best places in the world is a little place called the Golden Pudel in Hamburg, Germany. Hamburg is a great town, more aesthetically beautiful than Berlin and a little easier to process. The vibe is a little more easygoing. Anytime I've done nightlife there, people are really into it to have a great time. Berlin is a city that is known for nightlife and there are incredible places in Berlin, but it's very self-aware. People can get jaded in Berlin — they have so many opportunities to hear world class DJs at world-class clubs. The Golden Pudel is a 150-200 person punk club in a former mariner's prison on the water. They don't pay much and it doesn't cost much to get in. Everyone bartending or working the door is a creative person who is somehow involved with the club. 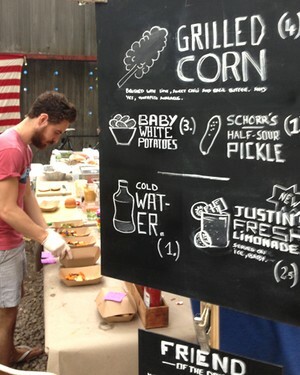 The last time we were there, the barback was the amazing illustrator who does their Sunday party materials. The DJ who was getting her doctorate in ethnomusicology runs a record store in Hamburg. Everyone who works there has a vested interest in the place. That is super community-oriented, and that is the energy of Hamburg. Where around the world would you like to play? It's hard to say because it's hard to know what the crowd will be like. Party scenes can be dead in interesting countries and cities. I love Rome and I love hanging out there, but I hear the party scene is dismal. I want to play in Japan because it has a reputation for having the best crowds who really know their stuff but are also really excited to dance. 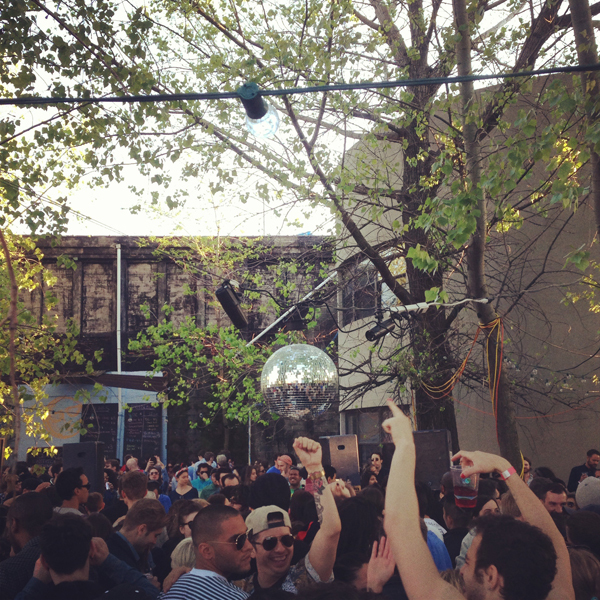 You have created this amazing party in the most unlikely venue, a toxic Superfund site. If you could play anywhere, where would it be? A forest would be super cool. We have ambitions to do a weekend getaway in upstate New York, maybe the Berkshires or the Catskills or the Hudson Valley. It would be great to take this party that's an oasis in the city to an escape from the city for a whole weekend where drinks and food and music are the focus for three days instead of six hours. When the day comes that we have to move the party — and it's inevitable that it will come because that's the story of New York; not even an institution like Delmonico's is in the same space — we will move the party. And it's inevitable also that when we move it, it will be different and it will be a feat for us to try to make it feel as comfortable. The secret ingredient is the trees. They make it majestic and comfortable. In New York City, trees means something. When is the last Mister Sunday of the summer? We will go as long as the fates allow us.